PennsylvAsia: Rashomon (羅生門) at Tull Family Theater, April 18. The film opens in torrential rain, and five shots move from long shot to closeup to reveal two men sitting in the shelter of Kyoto's Rashomon Gate. The rain will be a useful device, unmistakably setting apart the present from the past. 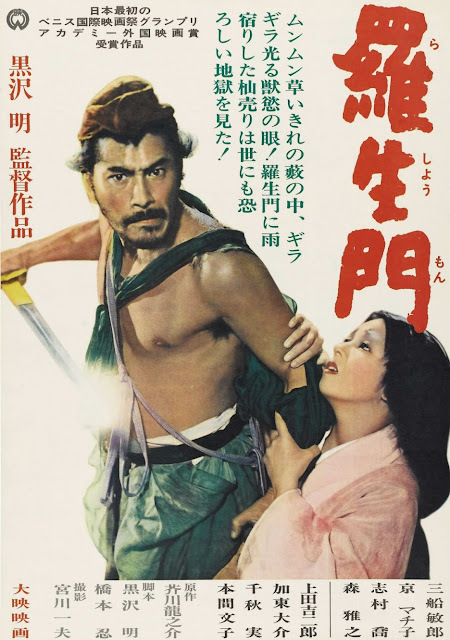 The two men are a priest and a woodcutter, and when a commoner runs in out of the rain and engages them in conversation, he learns that a samurai has been murdered and his wife raped and a local bandit is suspected. In the course of telling the commoner what they know, the woodcutter and the priest will introduce flashbacks in which the bandit, the wife and the woodcutter say what they saw, or think they saw--and then a medium turns up to channel the ghost of the dead samurai. Although the stories are in radical disagreement, it is unlike any of the original participants are lying for their own advantage, since each claims to be the murderer. The movie starts at 7:00 pm and tickets are available online. he Tull Family Theater is located at 418 Walnut St. in Sewickley (map), about 15 miles northwest of Pittsburgh.